Marcasite mär′ka-sīt an iron ore, a variety of pyrites (q.v.). Marcasite jewelry has been made since the time of the Ancient Greeks. 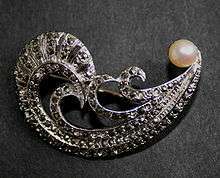 It was particularly popular in the eighteenth century, the Victorian era and with Art Nouveau jewelry designers. When Prince Albert died in 1861 Queen Victoria entered a period of mourning, requiring her entire court to wear black and avoid opulent jewelry. Marcasite became popular as an understated alternative for the nobility. Marcasite jewelry is jewelry made from pyrite (fool's gold), not, as the name suggests, from marcasite. Pyrite is similar to marcasite, but more stable and less brittle. It is frequently made by setting small pieces of pyrite into silver. Cheaper costume jewelry is made by glueing pieces of pyrite rather than setting. A similar-looking type of jewelry can be made from small pieces of cut steel. 1 2 3 4 Goldemberg, Rose Leiman (2000). Antique Jewelry: A Practical & Passionate Guide. iUniverse. p. 116. ISBN 0-595-08898-8. 1 2 Hesse, Rayner W. (2007). Jewelrymaking Through History: An Encyclopedia. Greenwood Publishing Group. p. 15. ISBN 0-313-33507-9. ↑ Colonia Jewellery (2015). The Story Behind Marcasite Jewellery. 1 2 Thomas, Arthur (2008). Gemstones: Properties, Identification and Use. New Holland Publishers. p. 121. ISBN 1-84537-602-1. Wikimedia Commons has media related to Marcasite jewellery.